My name is Cori Salchert. I am almost 50 years old and 27 years ago, I graduated from nursing school here in Madison. And I’m a wife and mother of eight biological children. Being an RN led me down several paths in my nursing career. Hospice was one of them. Twelve years ago, after having taken ten years off to be with my kids at home, I decided to return to work at my local hospital and work on the maternity floor. I had loved working with hospice, but wanted to help at the other end of the spectrum of life, where I thought all was sweetness and light. This rosy picture was quickly changed after seeing so many women come to the OB floor with miscarriages, stillbirths, and babies who would die shortly after birth. It wasn’t very long before I was once again working in a hospice role, only I was providing this kind of care to obstetric patients and their babies, not to the ill, elderly, and their loved ones. After these experiences, a number of years ago I began a program at St. Nicholas Hospital in Sheboygan, WI called HALO, or the Hope After Loss Organization. What I offered through that program was the same support and comfort to infants and their parents that older hospice patients and their families would receive. Any loss should be validated, and treated as worthy of the grief it caused. The length of the pregnancy, be it 8 weeks, 18 weeks, or full term wasn’t the point of HALO’s work. There was a baby, the baby had died, and the family was grieving. How could we best come alongside and support the grieving family? So much darkness in those rooms. I would stand outside the door and pray from someplace deep in my gut for the grace to walk in, with kindness and a steady, gentle confidence, and assure that the whole deal was difficult but it was possible – with TLC, some clothing, blankets, etc. – to make something. Something to help families remember their baby, without anything that would add to the grief. Once, I was having a difficult time not vomiting while preparing one baby who was falling apart in my hands as I tried to dress her. I needed to remember that what is here, right here in my hands, is not the end – she’s not forever going to look like she does at this moment. And she is still the beautiful daughter of her parents. I got her dressed, wrapped up in soft blankets, and her family held her for hours. Nothing about perinatal hospice is easy. Nothing takes the searing pain away. All I’m saying is that the pain doesn’t have to be the only emotion ruling, or remembered. I have a number of autoimmune diseases, and 5 years ago my health started to decline and eventually I completely crashed. I spent more than a year in and out of the best hospitals in the area, to no avail. Hundreds of thousands of dollars spent, seemingly thrown away, for what? To have me still bedridden, unable to do anything for myself. Eventually we found a hospital and some doctors who found a way to help get me back on my feet again. But it wasn’t without a lot of struggles. During my time of bad health, I felt that all my work with HALO, all of my nursing education, all the countless hours spent reading, listening to seminars, and attending conferences to enhance my role as a Bereavement Specialist, appeared to have been for nothing. Until August of 2012. A call came. 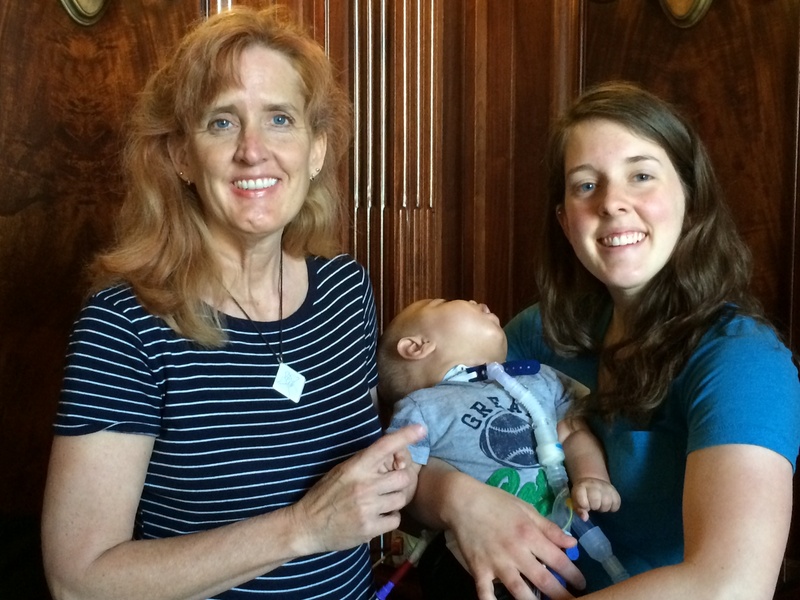 A baby, without the right or left hemisphere of her brain, needed a home. Would we take her. She had a life limiting diagnosis, and we no idea how long she’d live or if she did, what her life would be like. With a resounding “yes!” our family opened our home to receive this baby, without a name, without anyone who loved and cared for her. 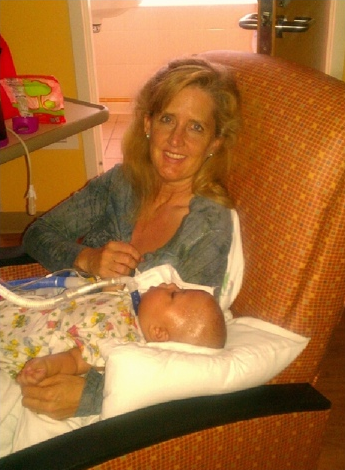 She’d been left at the hospital under the Safe Haven Law. And we were there to bring her – Emmalynn – home. We brought Emmalynn Rae Salchert home to live. She could have died in the hospital. Wrapped in a blanket, off to the side, not even held while she was fed. We brought this 6 pound, 16 inch babe home. Her body was deformed but very quickly, we managed to see past her physical issues and only saw the precious soul encased in her faulty body. 50 days she lived. We took her to the beach, and the bank, and the Bookmobile. She was held almost non-stop. We’d been told she was a “vegetable,” limited in her “capabilities” – but we proceeded to treat her like any of our other kiddos, and lavished affection towards her. Before Emmalynn came, because of how devastating my illness had been, my family was in recovery mode. My son described it as, “going through the motions, just surviving day by day.” After Emmalynn came, I personally found a purposefulness, and our family had a common goal to make whatever days she had with us nothing short of crazy amazing. It was as if our home came alive and was thrown into HD Color. What I’d like you to know is that I know how hellish it is to hear, “There’s nothing that can be done. The baby is going to die.” And, I want you to know that there are families like mine out there who still want to give these little babies every ounce of love possible before they leave this earth – whether these children are biologically “ours” or not. Bringing Emmalynn home to live with us, and having her die in my arms, was the hardest thing we’ve ever done, but it was so worth every sacrifice. She was snuggled against my breast. Tucked close to my heart. The last thing this precious baby girl experienced was her enveloped in love and physical comfort – with no pain. Nothing about perinatal hospice and palliative care is easy. But it means so much. And my family has no regrets. We care. We really mean it. We’re not asking everyone to be just like us. We just want parents to know both they and their child can be spared the pain of abortion. We’re there, arms open, officially licensed to take in kiddos whom no one else wants to take in because of their “flaws.” We love them. Words can’t express how happy I am that the Pain-Capable Unborn Child Protection Act provides families with more information about perinatal hospice. Losing a child doesn’t have to be all about the pain, and perinatal hospice helps give families the opportunity to make some good memories. We know unborn babies feel pain from abortion. And so do their families. But the Pain-Capable Unborn Child Protection Act gives babies and families the opportunity for not only avoiding some pain, but ensuring, through perinatal hospice, that pain isn’t the only memory families have of their precious little ones, now gone to a better place.